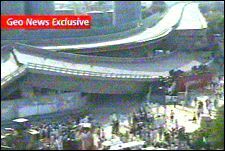 While the Benazir Bhutto / Musharraf talks have stalled, a brand-new overpass collapsed in Karachi, killing four people. Designed to alleviate the crushing traffic jams that last for hours in Karachi, the overpass bridge and the Northern Bypass are now not usuable. This was contracted out to Army firms, and not only will the design and architecture come under fire, but also the materials, and construction process. This is bound to raise some cries against the government and in one of the few areas where Musharraf still has reasonably strong support. The cry of corruption will undoubtably ring through the city. 70 Taliban have been killed in Afghanistan, three miles from the Pakistan border in a village near a crossing spot. A bomb making factory was destroyed along with armaments. 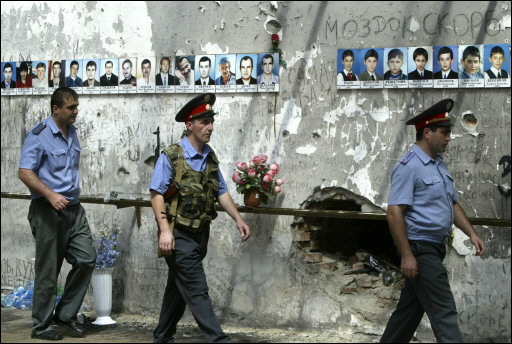 Sometime in the far future the name of Beslan will be forgotten; but not today; not while parents still mourn for their children murdered three years ago today. A tragedy is a tragedy, but for some it’s an opportunity for propaganda and politics. An Airbus A380 on a world demonstration tour scraped its wing on an hangar door while exiting in Bangkok, Thailand. The tips of the wings, or winglets, had to be removed before the flight could continue which caused a three hour delay. Story here. Officials said the accident at Suvarnabhumi Airport was related to the unusually long wingspan of the plane, for which the hanger whose door it hit had not been designed. “It was not due to problems with traffic control or human error of the captain,” said Thai Airways President Apinan Sumanaseni. He said that the left winglet of the plane had been damaged, but that engineers would remove the winglets ahead of the postponed flight. “The device removed is useful but we can fly without it … I don’t think it will affect the operation of the aircraft at all,” said Terry Lutz, the plane’s captain and head test pilot for Airbus. A winglet tips up and back from the end of a wing, improving aerodynamic efficiency.